Posted by bessie on Tuesday, June 29, 2010. The field of carbon emissions modeling is in a period of rapid evolution, shaped by ongoing transformations in climate science, information technology, government regulation, and the business environment. Demand for data about the impacts of carbon-emitting activities is steadily increasing— but so too are the complexity, opacity, and inconsistency of emissions calculation methodologies, undermining advancements in the field. At a time when carbon intelligence has an urgent role to play in stemming catastrophic climate change, a more deliberate approach to carbon modeling is warranted. Reactive attempts by authorities to establish consistent, transparent methodology standards have been only marginally successful, more so in the sphere of corporate carbon footprinting than elsewhere. As a small company developing carbon emissions models, Brighter Planet is committed to doing our part in helping transform this field. In developing our modeling approach, we were guided by three core principles: rigor, flexibility, and transparency. We knew that our system would need to provide high quality estimates that accounted for an emitter’s full and complete climate impact. We knew that the model would need to operate given huge real-world variability in the quantity and quality of data available about emissions sources. And we knew that radical openness and collaboration would be critical to maintaining trust and quality in a rapidly evolving space at the intersection of multiple fields. 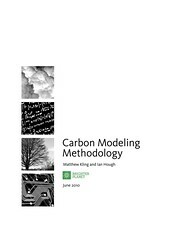 Our goal for this methodology paper was to provide insight into the approach and data that we use to model greenhouse gas emissions, both to help fulfill our commitment to openness by documenting our own practices, and to foster a discussion about best practices in carbon modeling to help advance the field. We welcome discussion and collaboration on this project!